I'm glad you are joining us on our Magical Winter Moments Blog Hop...if you came here from Karin's blog you are in the right place...if not you might want to start at the beginning here at the Sparkle N Sprinkle Blog and hop along. For my card I used the brand spankin' new Snow Family Stampette set (it's a smaller stamp set and less expensive too!) I stamped with Memento ink and colored with my Copics of course, but then for the snow and details I used Brushable Glue and Twinkling Clouds Sparkle N Soft for the snow and trim on the coats. I also stamped the snowflakes in the set with Versamark on the background and embossed with Winter White embossing powder. So leave me a comment for your chance to win and then hop on over to Dawn's Blog to continue. Nice card Jill. I like the colors. Love what you did with the new stamp set! This is one of my favorites of the smaller sets. I love how you used the snowflakes for the background paper also. Love this card. I especially like the pretty colors you chose. Lovely card Jill - love your color choices. And the coloring on that stamp is beautiful - really brings out the best of that new stamp. Fantastic background with the snowflakes! Your card has sold me on this stampette set! Love the two snowpeople and the tree. Wonderful! What an adorable card Jill. Love the coloring you used and the snowflakes in the background. Jill, just adore this card. Jill, I have always loved this saying....especially now that I am a grandma! LOL Really pretty card and layout. Love the colors. So glad you used the new stamp.. I love it...like the layout and use of snowflakes in background. Jill- I just love your cards. you always inspire me! thank you for sharing your creations. I'm going to have to go check out this set of stamps! LOVE the snow family - nice job on using the colors to tell a snowy story! Super card using shades of my absolute fave colour too! Great image - why didn't I buy that too? I have got to have these new stamps! Your use of color is super! What a wonderful card and sentiment. Thank you so much. Tee-hee . . . too cute! Love all the fun colors to go with that fun stamp! Wow! Love your colors. What a great card to receive. I love all the none traditional colors of your christmas card. Love the Stampette set also. Love the use of non-trad colors. It is darling! What a delightful card! I love the more pastel shades you used too, gives it a sense of serenity. Very nice soft colors.Love the stamp. Great card. I love the soft effect. What a cute card. I love it. The blended colors are great. Wonderful composition, too. What a great card, So nice to see alternative colors done in such a fitting way for the holiday. Love those colors! And your coloring is wonderful, very pretty card. Your color choices are refreshing - I really like your color choices! The stampettes are adorable! Jill, your snow people are really cute. The background paper is a perfect accompaniment. Thanks for sharing. Sweet card! I am partial to snowmen! Great colors too! Love those adorable snowman stamps! Great job! Jill, I love this image. What a sweet and sparkly card!! Beautiful card! Layout, colors, everything! And I especially like the stampette set - will have to get it! Love your use of purple and pink. Too cute! What an adorable card and I love your non-traditional colors!! Great card! 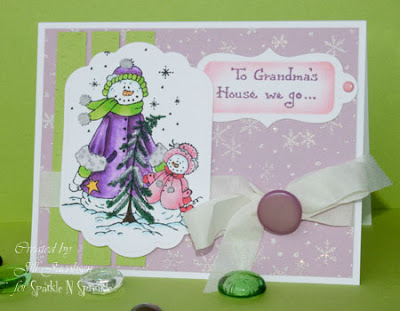 Love the layers and unusual colors you used for this card winter card. I love your card so nuch!! The stamped image is adorable and I love the colors you used...so pretty! Great card! I just love this stamp! You did a great job coloring and I love the colors you used. I think the snowman family is really cute. I love the way you colored it. Oh so pretty - love the colors you chose for the snowmen and how you used the snowflakes in the background - thanks for sharing ! Fantastic snowman yoy have done a great job on this card love the colors my favorit color. makes me wishe for Christmas soon love the way the snow makes you forget about everything, thanks for sharing and for the chance to win. LOVE the non-traditional colors used on your card, and your coloring is fabulous too! Just beautiful! Jill - Great coloring on the snow people. Such a charming card! Love the colors and you coloring just brings the stamp to life!